The Republican pooh-bahs in the NC General Assembly have now spent over $107,000 in pointless lawyer fees trying to defend the indefensible, the state's discriminatory Amendment One. Pointless? The pooh-bahs decided to spend the money after the Fourth Circuit Court of Appeals indicated that Amendment One was unconstitutional and thereby legalized gay marriage in North Carolina as well as several other states in the Fourth Circuit, and after the U.S. Supreme Court refused to stay that ruling, and after NC Attorney General Roy Cooper said he was therefore not going to waste any more of his time (and the state's money) defending the indefensible. But the pooh-bahs actually enjoy banging their heads into brick walls and spending our money needlessly. “I see no sense in stopping,” said the new Republican Speaker of the House Tim Moore. He really said that. What lawyer got the lion's share of that $107,000? California attorney John Eastman, director of the Center for Constitutional Jurisprudence at The Claremont Institute and ... wait for it ... chairman of the National Organization for Marriage. One of the people in this wide land who has been most teeth-grittingly determined to stand in the courthouse door against gay marriage is now profiting as a lawyer from defending the indefensible. It's a nice gig if you can get it. 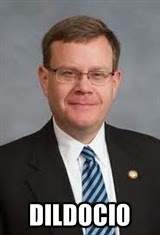 Luckily, Mr. Eastman has enablers in the NC General Assembly who don't know when to stop. Besides a waste of money, isn't this a possible ethical violation? The transaction needs to be looked at a little more closely. Are the funds going to John Eastman, his firm or to the National Organization for Marriage? Or is it being filtered to NOM through Eastman? This is possibly a transfer of state funds directly or indirectly to a political advocacy group. Perhaps using our open government laws to get some records such as email and correspondence would be appropriate for a group like Equality NC to pursue. NOM's in terrible financial shape. It wouldn't surprise me that this is simply a ploy to toss money to the organization, which is wanting to pursue their agenda in other countries, such as Russia and Uganda, since they're loosing so terribly here in the courts and in the court of public opinion.